Whether you are an amateur or avid fisherman, casting a line out into the mighty Colorado is quite the fun and enjoyable activity on a river trip. 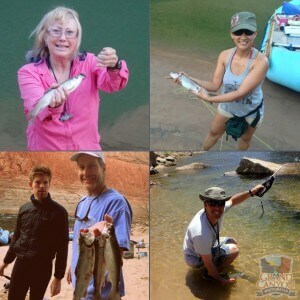 Here are a few tips and ideas about fishing in the Grand Canyon. -The most important thing is to get a fishing license. This can be easily purchased online through Arizona Game and Fish; it costs about $55 per license for non-residents. -Fishing is best in the first 60 miles or so downriver from Lees Ferry and when the Colorado River is running clear. If the river is thick with sediment and muddy, you will have limited success. The river becomes muddy when we get rainfall over the side streams and tributaries that empty into the Colorado River. Two of the largest tributaries merge with the Colorado River near Lees Ferry and at river mile 60. That doesn’t mean you can’t catch fish throughout the Canyon. The Canyon is home to many brown and rainbow trout as well as carp. -The best lures have been large, fluorescent orange z-rays, small daredevils with a spot of orange or fluorescent red, and different colored worms. Corn, salmon eggs and cheese, etc., are allowed and have been very successful in relatively clear water. We do not have storage provisions for live bait. Another recommendation has been for an assortment of KastMaster and Panther Martin spinners with lots of gold and silver. -There are native and endangered species that you need to be on the lookout for — primarily the Humpback Chub and the Razorback Suckers. If you do catch these fish, please catch and release as the National Park Service is attempting to bring these fish populations back. -The only real restriction is that you can’t fish from the boats; fish from the shore only and you’ll be good to go. -Most any fishing pole will work, as long as it is collapsible. Whether it is a fly rod or just a spinning rod, if it breaks down even in half that should be OK.
-Also be careful with critters and bird; they love to get into lures and equipment while on shore. -Even mini fishing poles will work: Here is a Daiwa Mini or a plastic ‘pocket’ fishing pole. Feel free to bring your favorite, just understand that, even in a case, it will probably get scuffed up a bit when it is stored on the boats.